Often when I am explaining what ePromos does I start by listing some of the common things we put logos on: pens, mugs, shirts and totes. Pretty much everyone is familiar with these things, but we offer thousands of different promotional items. I usually describe it as “everything that exists in the whole world, but with your logo on it,” and that’s pretty accurate. We imprint stuff that most people don’t even think of as an item, much less as a marketing item. 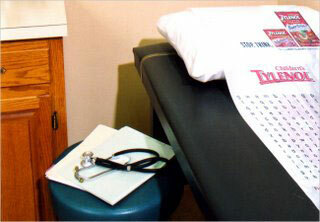 Case in point, a disposable pillowcase and sheet for a doctors office: a kid-friendly design and Children’s Tylenol logo actually make the room a little cheerier and less threatening. Are Your Logo Pens Imprinted Correctly?